2:00 AM Encounters. What's Up With That ? You might have noticed this, and I know it has been mentioned here once or twice. It is, the clusters of sightings/encounters that occur at or around 2:00 AM. Really, it is uncanny how many there are. 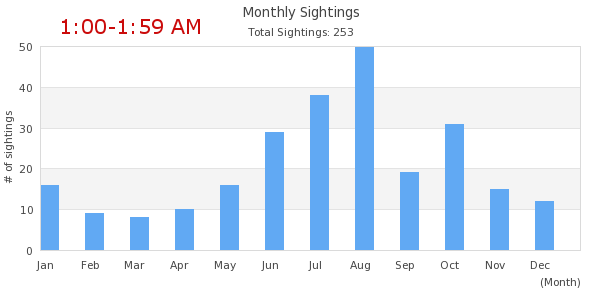 Aside from the fact this is deep into the wee hours when you'd expect a furtive diurnal animal to be most active, any ideas? Why not, say, 2:30 or 3:00? Why not at all hours, with no clusters at all? It is a weirdness. Wow. You are not wrong. A quick Google search revealed a few accounts that all occurred at 2AM. I did come across something called the "Bigfoot 3AM Challenge". Off to read up on that. One more element of high strangeness to go along with all the others. Its when the beast wakes from its slumber and has the munches for its favorite snack............. nylon wrapped crunchy man burritos to eat! 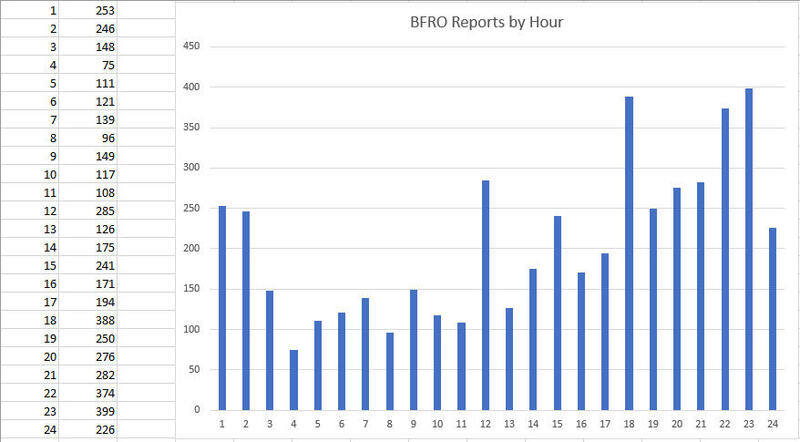 Here are the SSR BFRO reports sorted by hour. 12:00 (noon) and 6:00 pm are skewed because they get used by default when no time is specified. BFRO entries are mostly complete in the SSR except for Canada. That BFRO chart is very interesting. 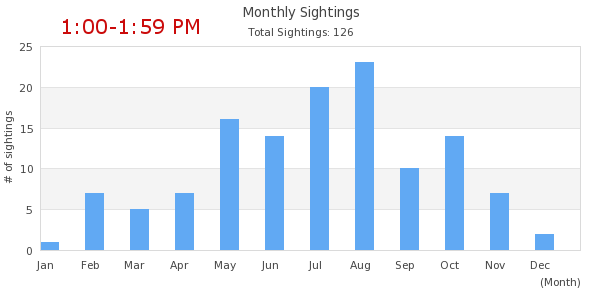 If we can throw out noon and 6pm, the corridor of time to be out in the woods listening and watching is 8pm-11pm. It would be interesting to see if that time frame held true in all major regions throughout the country. 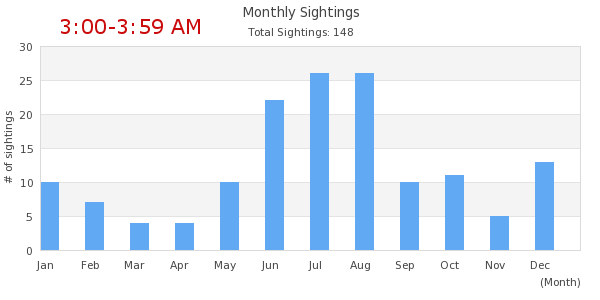 Be nice to know what time of year it was to go with this chart for the morning and evening hours, sunrise and sunsets. Thanks for the data Redbone. Maybe I do have somewhat of a confirmation bias for this, but it does look like Midnight to 2:00 are the "witching hours", and look at how steeply they drop off at 3:00 AM. 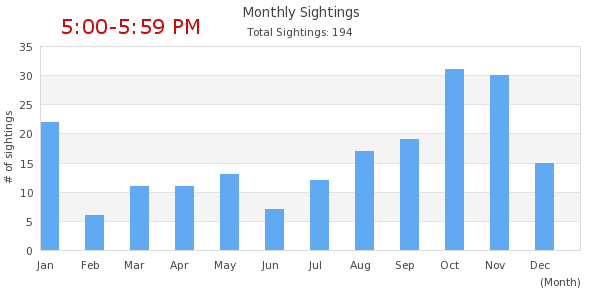 I do think probably the 10:00 to Midnight spike might be largely due to the high number of sightings by motorists. 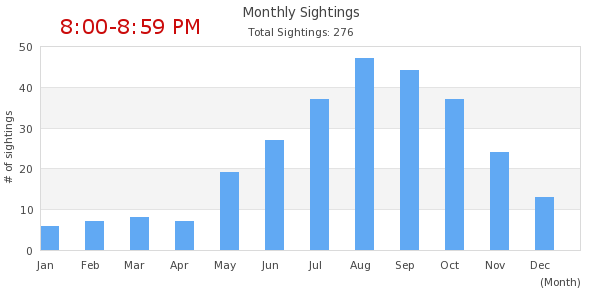 If you are out at night, you're most likely coming home around that time, and if you are a foraging animal this would be around the time you would be moving from your day-bed area to your feeding areas. 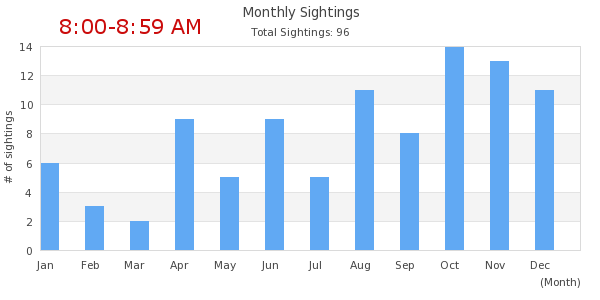 My sense too is the 2:00 AM sightings/incidents are skewed towards reports from campers. 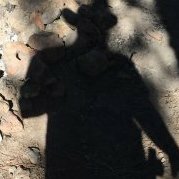 I remember Tal commenting once that he has several encounters that happened on expeditions at that time, like clockwork. These charts are very helpful, didn't even know about them. Thank you so much! The creature crawls into people's heads so a person tends to dwell on one thing or another, making that a focus. 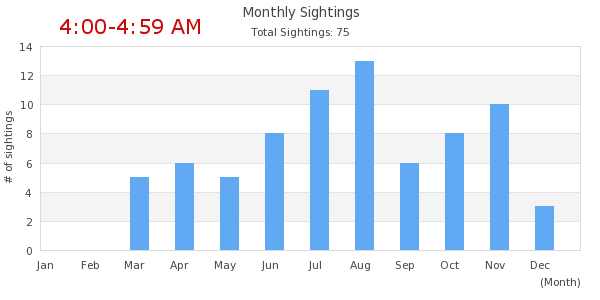 The data (should anyone be able to collect all of it or good sized sampling other than a random web search) would show that sightings, encounters and such occur at all hours. 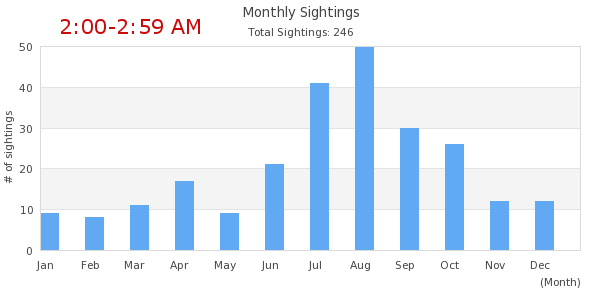 They show nocturnal behavior as much as they show daytime behavior. Redbone. I added a time of day chart to the SSR to make this easier. It doesn't plot 6pm (18:00) because it is the default (as you noted). All charts below are for CA, OR and WA. 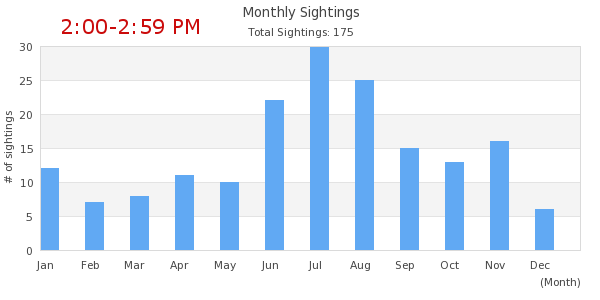 Looking at all of these charts, I can see a pattern of sightings starting to increase at the onset of sunset, and decrease at the onset of sunrise, as they change throughout the months. 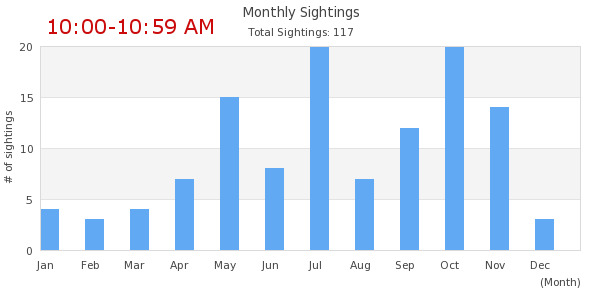 Each month, sightings start to increase later and later until around nine o'clock, or so, then start getting earlier and earlier again. To me this makes sense due to the overall nocturnal nature of this creature. It's going to wake up and start moving around at sunset and go to ground mostly around sunrise. Of course, since Bigfoot is not strictly a night-time creature, there are quite a few sightings that seem to point to the opposite. A creature that gets up at sunrise, and goes to bed at sunset. We humans are, for the most part, the opposite of that. The majority of us sleep at night, and move around during daylight hours, but a handful of us sleep all day and move around at night. Not just because of work, either. Some people are actually wired to be active at night, and rest during the day. 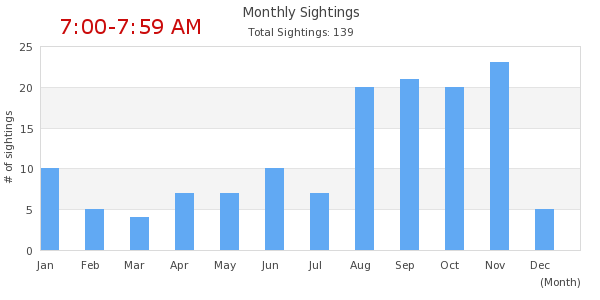 August is also skewed because if a report specifies "summer" with no month, that is what we use. 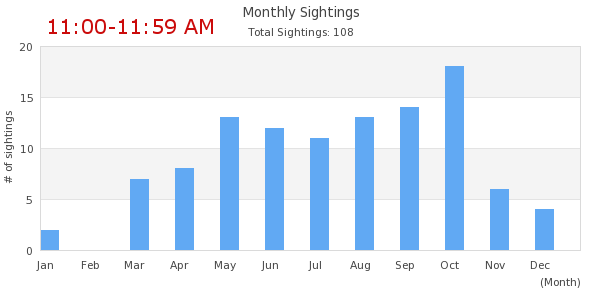 The same is probably true (but not as noticeable) for February, May, and November. 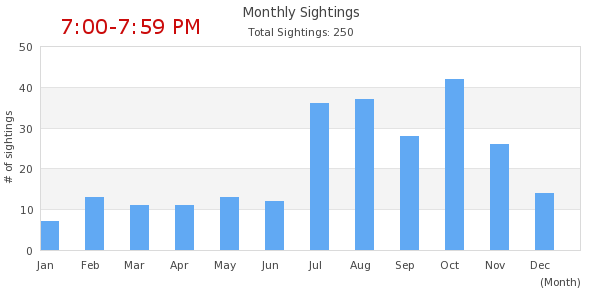 The charts from Gigantor above are probably better because that skewed data is not present. I wonder if those monthly charts show when the young are born? 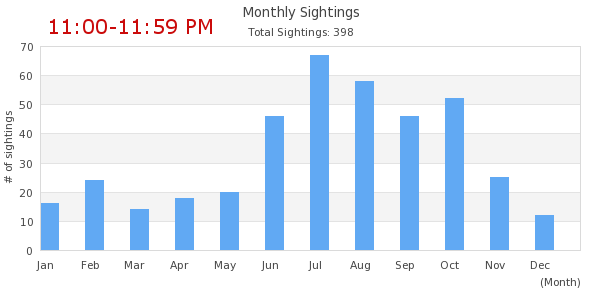 The charts would have to be modified to only include sightings with infants. Then we would have to have an approximation of growth rates, which we would have to infer is similar to humans or perhaps great apes...neither of which would necessarily be accurate. 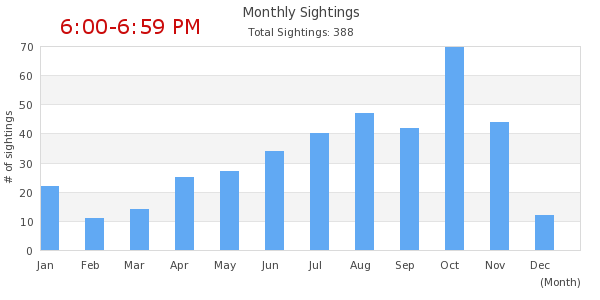 Vast increase of sightings in spring through fall. 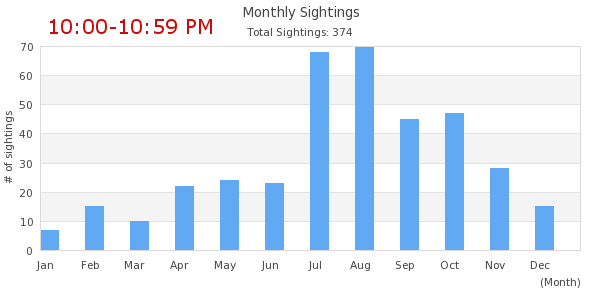 Most humans are out recreating in bf habitat = more opportunities of an encounter by any specific individual? Or does it? 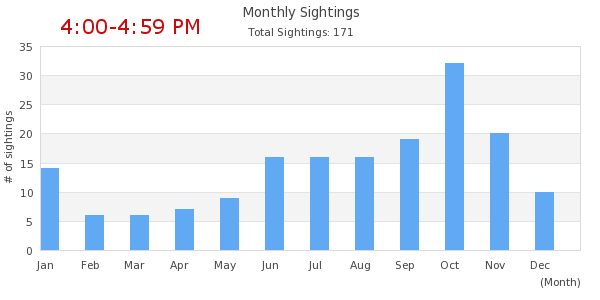 If we can separate drivers from those that are camping (or headed to camp/hike) that will likely give a more consistent number of sightings by season...but that doesn’t matter too much since the ratio of sightings by season and time seem to be similar. 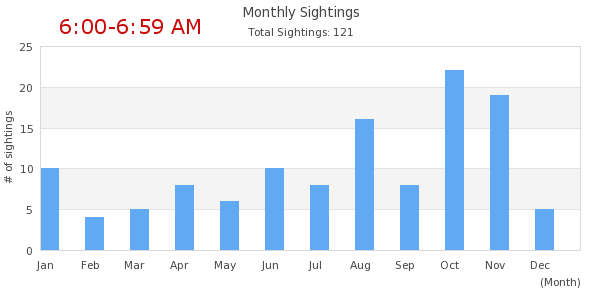 If there is a difference then we can infer that bf is sensitive to cold if they are not as active in winter months based solely on sightings...but even that would be skewed if we assume humans do not venture as deep into their habitat in the winter months. Conversely, far less humans tend to be awake and alert at night. 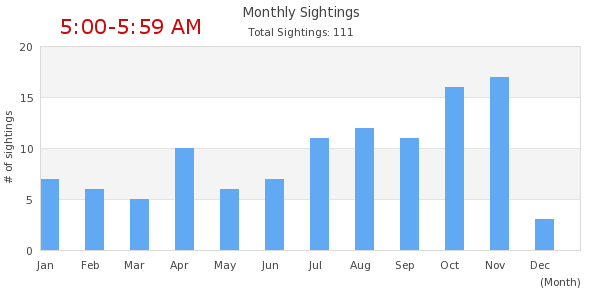 The high number of sightings at night therefore again confirms a tendency towards a nocturnal bf as it is less likely a human will be awake/alert or have sufficient sensory capabilities to detect one at night. The charts can can tell us just what they do. Likely mostly nocturnal. We can use what we have, which is knowledge of human behavior to confirm that. 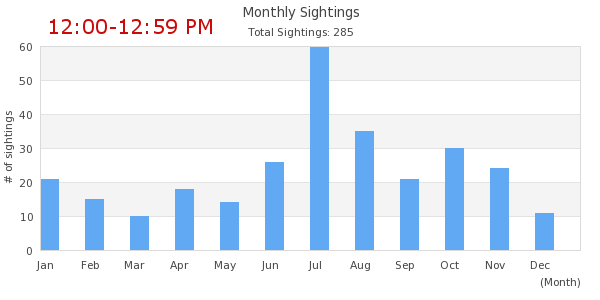 What would require more data for analysis but would be useful? 1. Situation/circumstance. 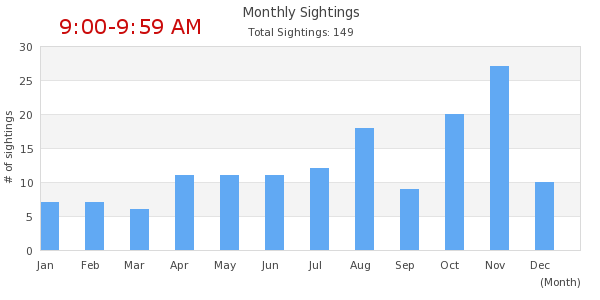 If day sightings were a result of humans disturbing snoozing bf and bf investigates human activity disturbing them or simply tries to avoid humans and is observed. 2. 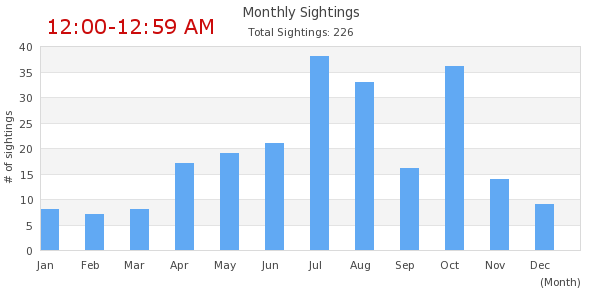 The approximate decline of # of humans in bf habitat during winter months vs # of bf sightings during day/night in winter months. 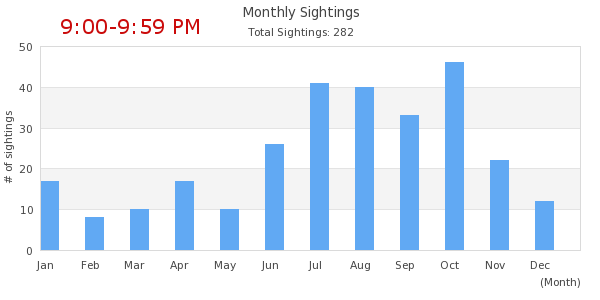 Would it suggest bf is more active during the day in colder months? 3. 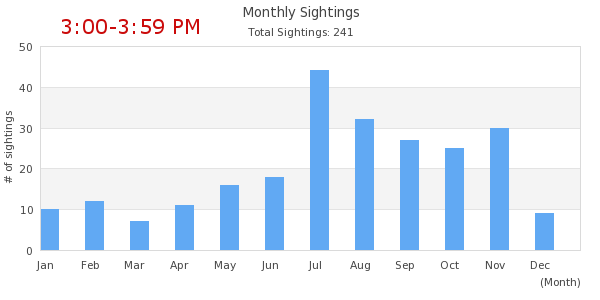 Is bf less “on guard” in winter months due to the decline in human presence making chance sightings more likely and their diligence diminished to some degree? Data on those factors COULD (but not necessarily) suggest that statistically a person could have a higher likelihood of seeing bf during the day during winter months than between 8p and 2a in summer months.